Rebecca Rodriguez's vibrant table runner was inspired by magical memories of painting in elementary school. Perfectly imperfect paint drips and well-used smocks can become abstract masterpieces. Rebecca Rodriguez's vibrant table runner was also inspired by magical memories of painting in elementary school art class. Its multicolor paint palette is digitally printed on linen, then hand cut and sewn, offering an eye-catching focal point for the colorful chaos of dining with family or friends. Runner designed, cut, and sewn in Somerset, New Jersey; fabric printed in Durham, North Carolina. Machine wash warm or cool on delicate setting using phosphate-free detergent. This is a quirky fun table runner for my kitchen table. I'm an artist and I paint with water colors and do calligraphy. My house is colorful inside and I've done a bit of calligraphy lettering on the walls with stencils I've made, such as Wash and Dry in my laundry room and had previously painted a desert mural in my master bath. 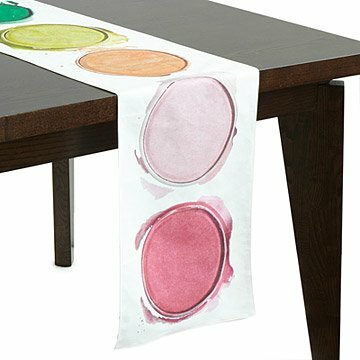 I have paint cans of many colors so this table runner was right up my alley! Love it and the fabric is much nicer quality than expected, almost linen like. Very pleased that I finally purchase it. I had my eye on it for awhile. The runner is exactly how it looks and is described online. Adds a touch of whimsy to a brunch, casual lunch.....really like it.